The year is 2154. The divide between the upper and lower class has become so great the rich have moved off the planet to an exclusive space station that orbits the Earth. What becomes of society when faced with hopelessness? 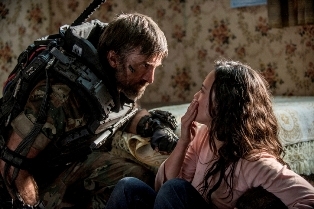 Neill Blomkamp’s sci-fi action thriller Elysium is the study of one man’s quest to rise above his lot in life. Filled with great concepts and exciting action sequences, Elysium is intelligent sci-fi that’s not overly cerebral and is fun without devolving into mindless bombast. 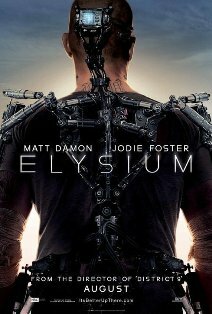 worker Max (Matt Damon) is desperate to leave the overcrowded despair of Earthly existence for the utopia he believes exists on Elysium. The population of Elysium is strictly controlled by Defense Secretary Delacourt (Jodie Foster), who cold-heartedly shoots illegal immigrants out of the sky as they ferry to the station via shuttles from Earth. Delacourt is obsessed with keeping Elysium exactly as it is. Worried the president (Faran Tahir) has become too soft on the “illegals” (as anyone from Earth is known) trying to infiltrate their perfect society, she hatches a plot to overthrow the government so she can have complete control. An accident at work, leaving Max with only five days to live, thrusts Max into a battle with Delacourt that may change the fate of Elysium and all of society. 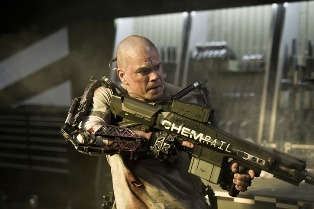 Elysium is quite imaginative in its portrayal of its less than hopeful future. The film shies away from typical dystopian imagery in favor of a bright, but stark, landscape filled with familiar images of poverty. Shanty towns line the dirty streets, workers trudge to their jobs in crumbling concrete buildings that haven’t been updated in years. Technology seems to only belong to the criminal underground. On Earth, no one even carries a cell phone. However, technology does exist. Desperate to change his situation, Max agrees to undergo the most extreme of body modifications. An exo-skeleton is screwed into his body, while a computer interface is wired into his brain. 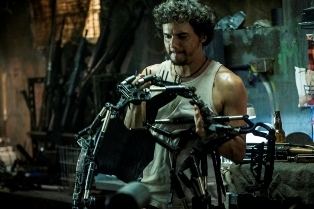 He strikes a deal with crime lord Spider (Wagner Moura) to obtain some top secret Elysium info, which is has been uploaded directly into the brain of an operative, in exchange for transport to Elysium. In contrast to Earth, the circular space station is the picture of luxury. All resources have been poured into the space station. Between its walls, lush green lawns sprawl out from luxurious mansions. While Earth’s citizens struggle to make it to their low paying jobs under the constant scrutiny of police droids, Elysium’s citizens attend lavish dinner parties or relax by their swimming pools, seemingly without a care in the world. While Max represents the everyman, with that undying desire to prove himself, Delacourt represents corruption. Unfortunately this leaves Delacourt as nothing more than a one-dimensional caricature. Max is given to opportunity to learn something about himself and his place in the world, and Damon turns in a solid performance. He makes his character believable whether handling a heavy action sequence or a more subtle emotional scene. Foster, on the other hand, plays her character with no nuance at all. I have to say, she’s probably the weakest element of the film. Delacourt is singularly evil, and really not all that interesting. I would have liked to see a more compelling reason for her obsession other than just wanting things the way she wants them. I loved seeing Max’s journey as his mission transitioned from saving his own skin to a much greater purpose. In a world that has devolved into an every-man-for-himself society, the idea that one person can still make a difference is a powerful one. But I wanted to see more of Elysium. We get no sense of what the people there are like or if they care about what is happening on Earth. There is almost no political context, which leaves the motivations of the powers-that-be on Elysium a little empty. We could just assume that everyone are just shallow rich folk that care for nothing other than their own perfect existence, but it would have been nice to have something a little deeper. There’s just enough social commentary in Elysium to give something to grab onto, but not enough to make the film heavy handed in some political message. Sure immigration and health care are touched on, but the story of individual empowerment is the stronger message.